In the summer of 2003, Princeton Survey Research Associates conducted a poll of 1,201 American adults regarding the media for the Pew Research Center for The People & The Press. They found that a majority (53 percent) of Americans regard the press as 'politically biased,' and most of those said the media tilted to the left. 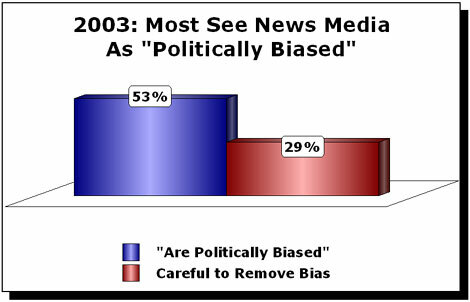 'Most Americans (53 percent) believe that news organizations are politically biased, while just 29 percent say they are careful to remove bias from their reports,' Pew reported. Even Democrats thought the press tilted left, not right. Among Democratic respondents, 41 percent thought the media are liberal, compared to 33 percent who found the media to be conservative. Among Republicans, 65 percent said the press is liberal, 22 percent find the media to be conservative. 'Americans are divided over whether press criticism of the military serves to keep the nation militarily prepared (45 percent) or to weaken the country's defenses (43 percent),' Pew found. Republicans were especially likely (63%) to say that media criticism was harmful to national defense. Journalists also fared badly when it came to public perceptions of their ethics. Pew found that majorities think journalists 'don't care about the people they report on' (56%), 'try to cover up their mistakes' (62%), and are 'often influenced by powerful people and organizations' (70%).